Though the country is well-known for its large, quality selection of ponies, England has turned out some strong horse breeds as well. 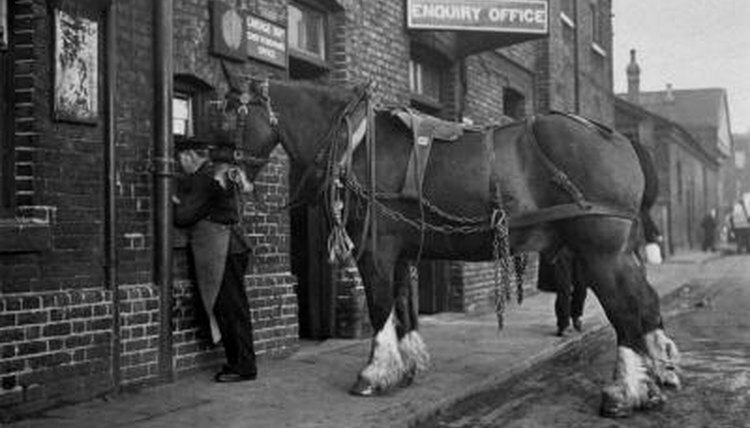 Mostly bred for agriculture and war uses, horses like the Shire, Suffolk Punch, Cleveland Bay and Hackney were held in high esteem as work, war, pack or travel horses, and are also well loved today. The Cleveland Bay, from the Cleveland area of northeast England, is Britain's oldest breed. The result of combining a Chapman pack horse and Barb stallions, the Cleveland Bay emerged as a powerful and popular pack and harness horse. While farmers used these equines to draw carts and wagons, the demand for faster carriage horses resulted in crossbreeding between Clevelands and Thoroughbreds to create another form of Cleveland known as a Yorkshire Coach Horse, a tall elegant carriage horse used mostly by the rich and royal. Today the breed is very rare, with only about 500 purebreds throughout the world. Derived from the French word "haquenee," which describes a riding horse with a particularly comfortable trot, the Hackney became well-known as a general-purpose riding or driving animal during medieval times because of its stamina and soundness. This equine felt just as comfortable doing farm chores as it did transporting travelers over long distances. The cavalry even used some in wars and skirmishes. In the early 1700s, breeders crossed the Hackney with imported Arabian stallions to add refinement to the breed while still keeping all original breed traits. The Shire, also known as "the Great horse," originally served as a war horse when knights started wearing heavy suits of armor that smaller horses were unable to carry. Later, this equine used its strength plowing on the farm and pulling barges on canals during the Industrial Revolution. Because of motor vehicles, tractors and the railway, the Shire's population declined from well over a million to a few thousand by the 1960s, until a small group of breeders made an effort to reestablish the breed's popularity as a working and riding horse. Differing from its Shire cousin, the Suffolk Punch was the only draft breed developed specifically for agriculture as opposed to war. Standing between 16 and 17 hands, the Suffolk Punch tends to be shorter and more stocky than other draft breeds. It is famous for its exceptionally good feet, and appears in chestnut colors with very little white other than stars and snips. This breed is also very rare, with only 1,350 Suffolks worldwide.